This spring, on the eastern coast of the United States, we have not witnessed tree pollen spikes as we have in prior years. This is not to say that those suffering from tree pollen allergies will not be or were not affected this year. They most likely will. However, due to unpredicted weather changes, tree pollen spikes did not rise to anticipated levels. It has to do with unseasonably cold temperatures. We’ve had cold spells this spring that have basically divided what is typically a harsh tree pollen season into two, less extreme sub-seasons. In March, we experienced temperatures in the 80’s which caused cherry blossoms to bloom earlier than expected and tree pollen counts to spike to 2-3x beyond their daily averages. It appeared that we were in for a long pollen season. But, then it happened. In early April, it got cold again. Really cold. And this halted the tree pollen spread in its tracks. In late April, of course, it got warm again and pollen levels spiked once again. However, the spike wssn’t even close to historical levels, finishing at 1,596 grains per cubic meter which ranked 2nd to last in 20 years of measurements. This matters to pollen sufferers because, unlike in recent years, there wasn’t an overlap. 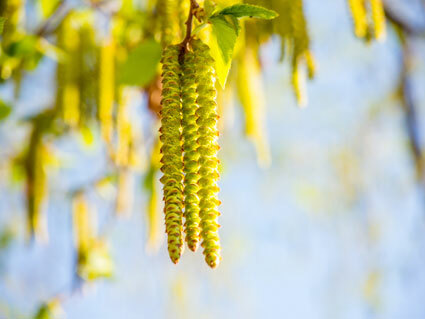 Tree pollen from early pollinators such as elm, maple, cedar, cypress, and juniper trees arrived in the first wave then were halted with the April cold front. Then, in late April, the late season pollinators such as oak, pine, ash, sycamore, mulberry and birch trees arrived. Had it not been for the cold spell, the early and late pollinators would have overlapped causing pollen counts to potentially rise to 4,000 grains per cubic meter and wreaking havoc with pollen allergy sufferers. But, again, the cold spell prevented the overlap and prevented tree pollen counts from rising to those levels just recently experienced in 2009 and 2010. Thankfully, we are now in the midst of true tree pollen decline. But, be cautious: the grass pollen season will be upon us in a couple of weeks usually hitting its peak sometime in the middle of May so, as we talk about in our article titled “Is It Allergy Season Already?”, get prepared for it ahead of time. Make sure you take a shower and wash your clothes immediately after mowing the lawn. Take a look at over-the-counter or prescription-strength antihistamines. Look into sinus rinses and nasal sprays. If these don’t work, give BergerHenry a call and we’ll treat it appropriately. Treatment options can include allergy shots, sublingual drops, immunotherapy, and more.